-Reusable Snack Bags are safe for your little ones.These bags are FDA approved,BPA Free,lead free,phthalate free. -Sandwich bags with double layers 100% waterproof soft fabric construction provide no leak design and more air tight. The double layer long-lasting protection ensure there is no need to worry leakage. 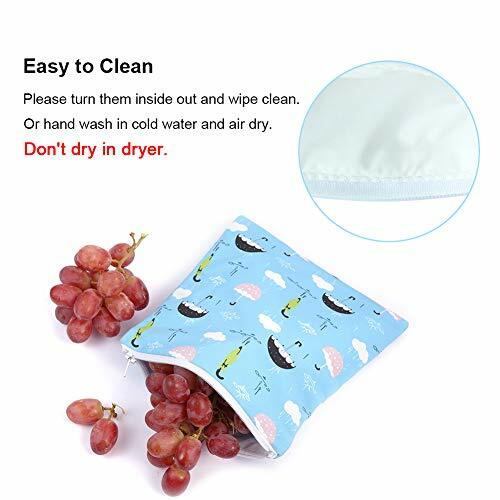 -Known as the safe sandwich bag alternative,our resealer snack bag is conveniently washable.Turn them inside out and wipe clean.Or hand wash in cold water,air dry.Don't dry in dryer. -The Reusable Lunch Bags helps us creating a waste-free lunch!No more plastic baggies,plastic wrap or aluminum foil.Not just for food,the bags are great for kids rayon,art supplies,small toys,baby pacifiers,diapering items,day care or pre-school items,stashing electronics,keys,makeup,toiletries,travel and endless other possibilities. -Each snack bag measures 6.5 in. x 7 in. 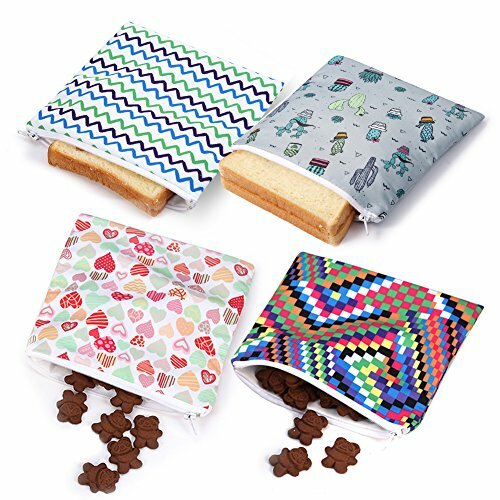 -snack bags are available in a variety of cute,trendy and vibrant patterns,making them a fashionable alternative to plastic baggies. This is a no-risk purchase.If you are not 100% pleased,we offer a full 30 day money back guarantee. ECO-Friendly And Reusable - Sandwich baggies are non-toxic,phthalate-free,lead-free,BPA free,PVC free,No heavy metals.Made from food-safe polyester fabric which gives you the perfect solution to keep your food healthy,fresh and safe.No more regular plastic bags,enjoy our recyclable food bags. 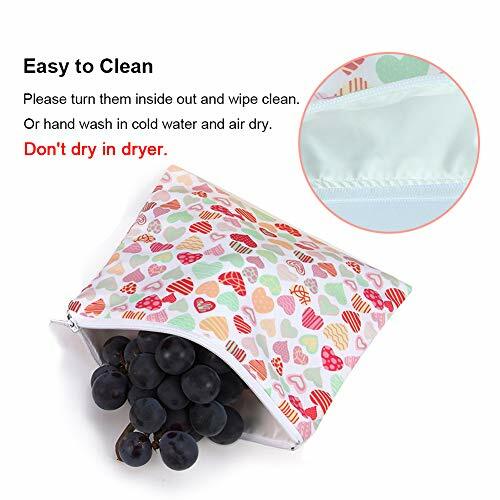 Reusable Snack Bag Set - You can get 4 large bags( 7 x 6.5 inch ) in one set.Machine washable and dishwasher-safe (top rack) for convenient clean up,hang dry only.Makes life easy for parents. 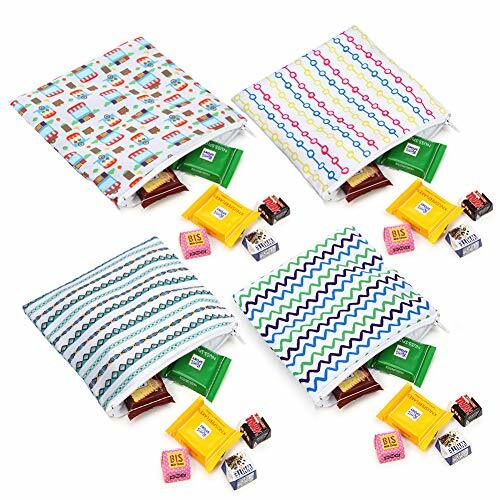 Countless Uses - Reusable snack baggies mean less waste!Not just for food like sliced fruit,sandwiches,sticky or messy foods as well as any dry snacks.These snack bags are also creative for safely storing electronics,keys,makeup,medicine, your purse,diaper bag,travel items,and endless other possibilities to keep things simple. Durable Construction - Cloth Snack Bag with double layers fabric construction provide no leak design and more air tight.All of the bags are precise stitching and quality interior & exterior fabric makes these bags durable. 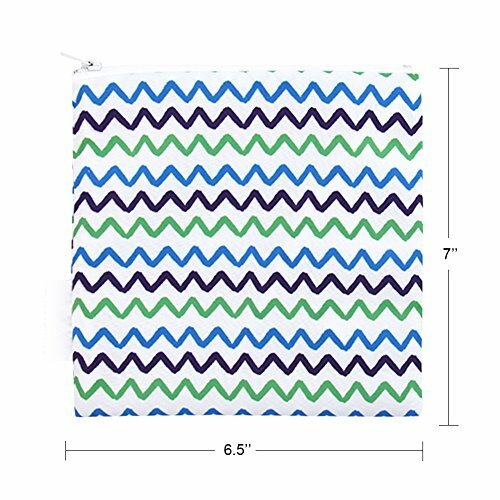 GUARANTEED: Our reusable sandwich Baggies are available in a variety of cute,trendy and vibrant patterns,making them a fashionable alternative to plastic baggies.This is a no-risk purchase.If you are not 100% pleased,we offer a full 30 day money back guarantee.